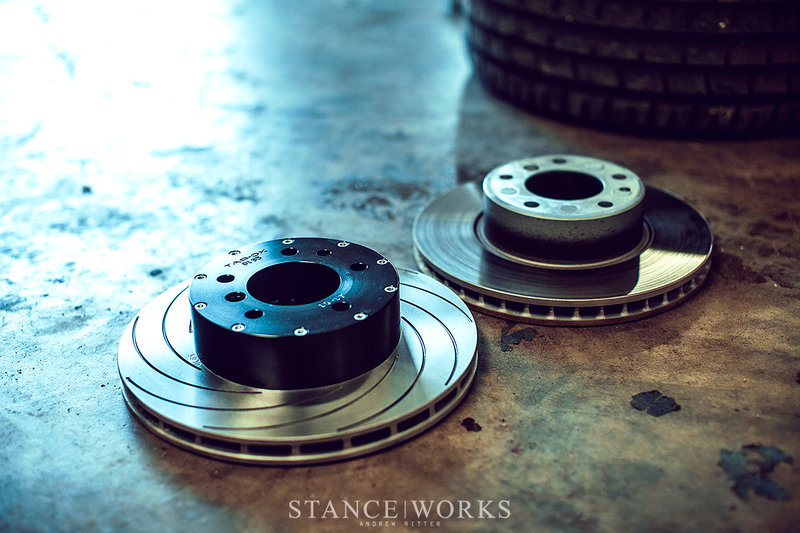 When building the StanceWorks "Parts Car" E28 last year, brakes stood as one of the more interesting hurdles of the project. 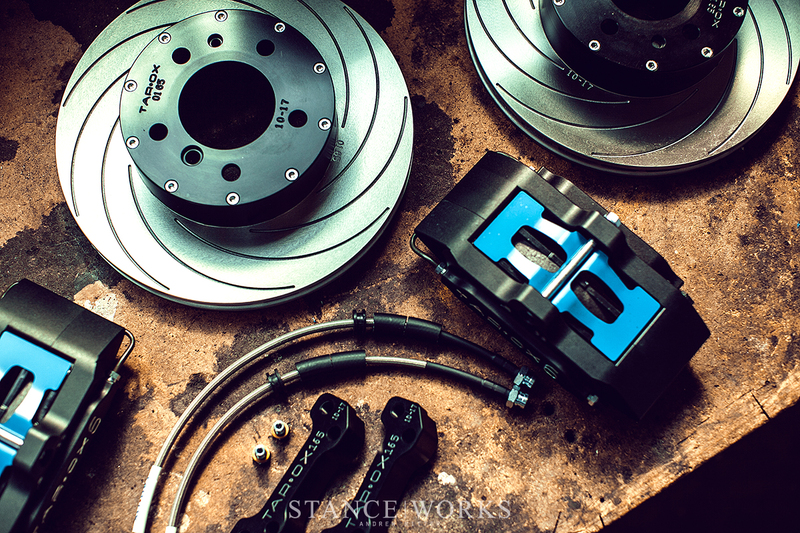 Big brake kits aren't exceedingly common for E28s - understandably - which means more often than not, the E28 community resorts to "OEM big brake kits:" sourcing larger brake calipers and rotor packages from other BMW models that just so happen to bolt up. E28 M5 brakes are an obvious go-to, but their current unavailability from BMW, and their high market price, means that the 4-pot pistons can be tough to get your hands on. 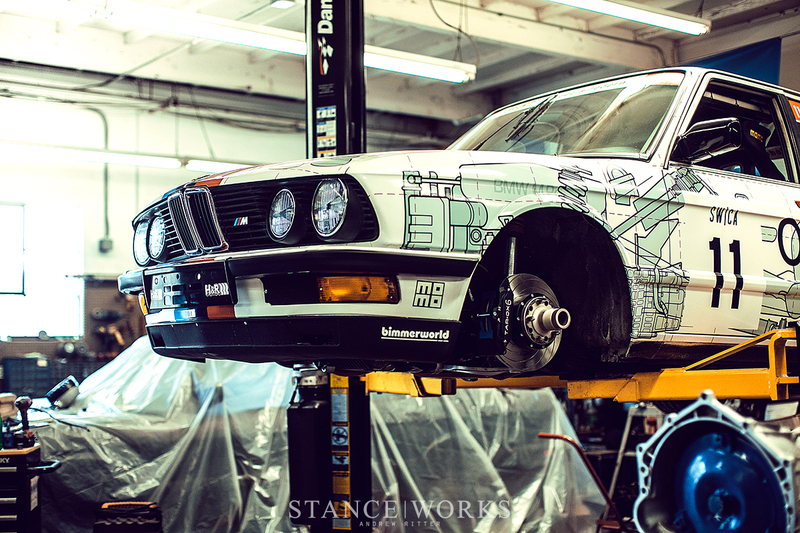 For most E28 guys, it's the E34 540i brake package that is the gold standard. The parts are cheap, and it's a decent size improvement over the factory units, making for a cost-effective upgrade for the weekend warriors out there. 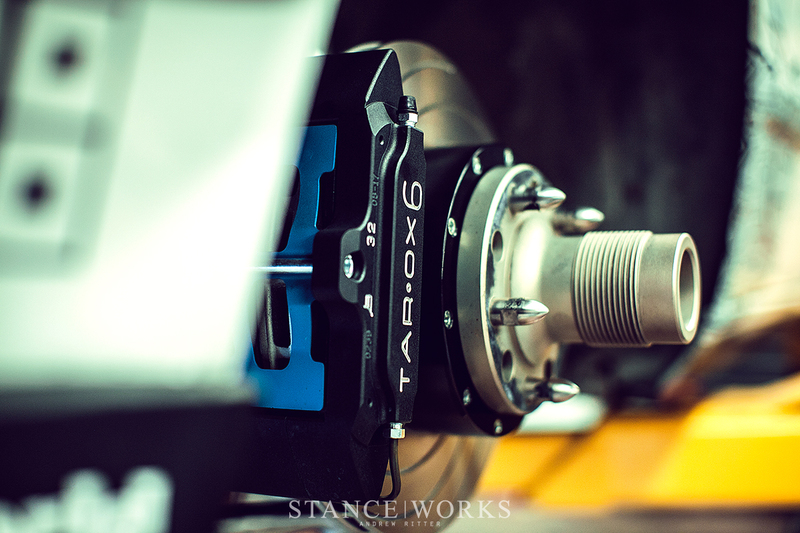 However, after tracking the Parts Car, I was ready to demand more from the E28, and thus, I reached out to Tarox Brakes. 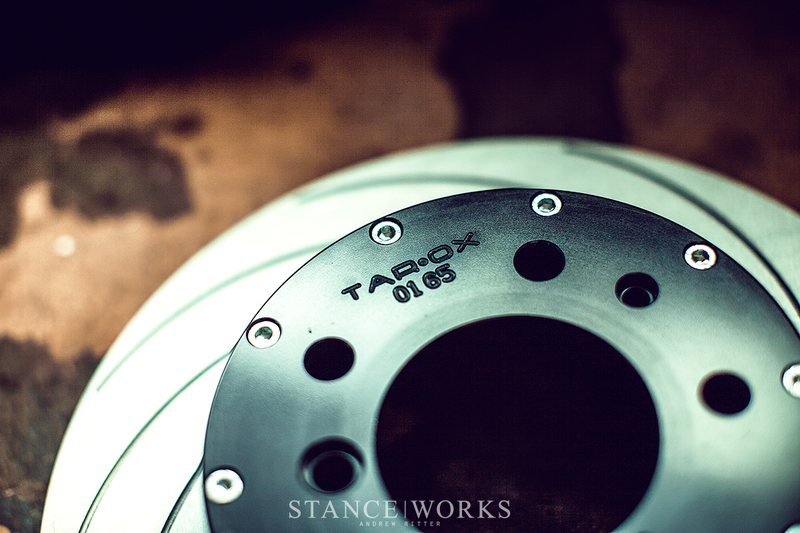 It wasn't long ago that we dove into the history of Tarox Brakes, sharing the story and foundation that separates them from your standard brake manufacturer. 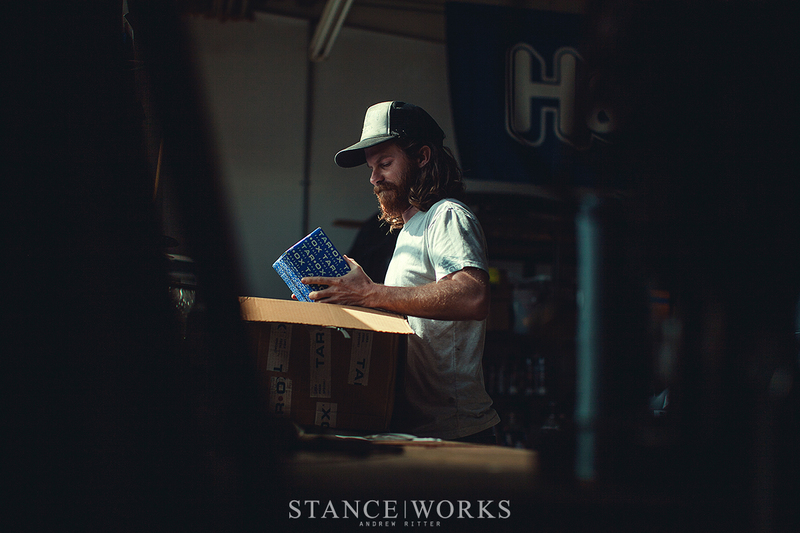 Their strengths and passion as supporters of esoteric builds made them an obvious choice when it came to the Parts Car. 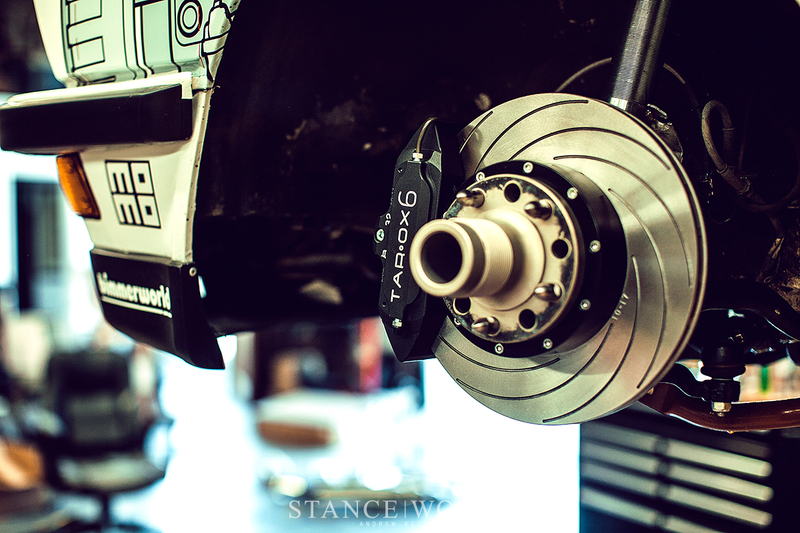 With high quality big brake kits being few and far between, it was a match made in heaven. Luckily for me, they even stocked the part, meaning supporting my choice of chassis was met with an off-the-shelf answer. 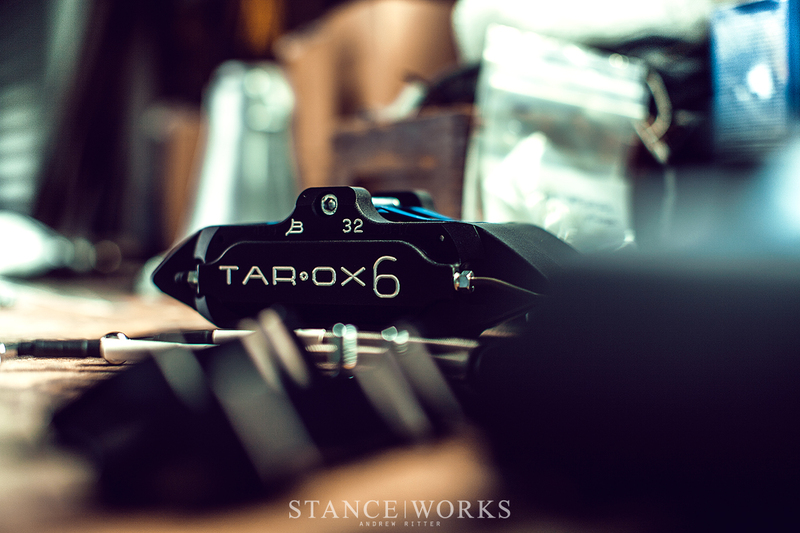 Arriving in beautiful blue boxes from Italy, Tarox sent over what we deemed best for the build. Up front, I'd be fitting a set of their B32 6-piston forged calipers, and with them a set of 310x26mm F2000 rotors and Tarox Corsa street/track brake pads. While Tarox does offer a bigger option, we chose the KMBM0165 kit for the sake of ensuring the system will clear period-correct 16" wheels, should I chose to run them. 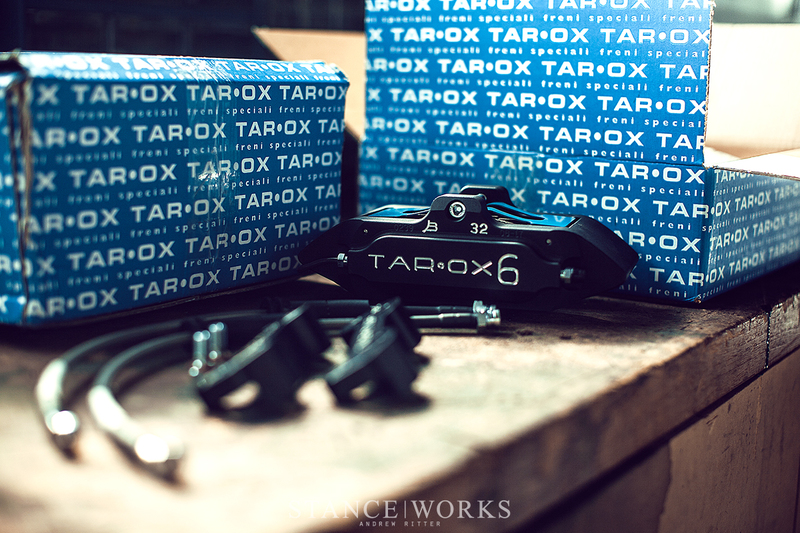 As a direct bolt-on kit, the package from Tarox included everything needed for the install, including the necessary brackets, hardware, and braided brake lines. 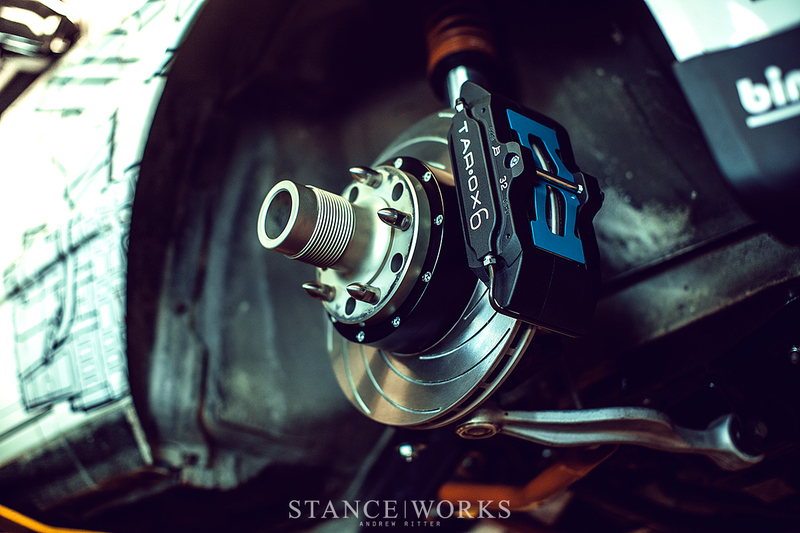 The calipers themselves are forged, hand-assembled 6-piston units, which are directly derived from the very kit that Tarox launched their "big brake" program with for the E30 M3. 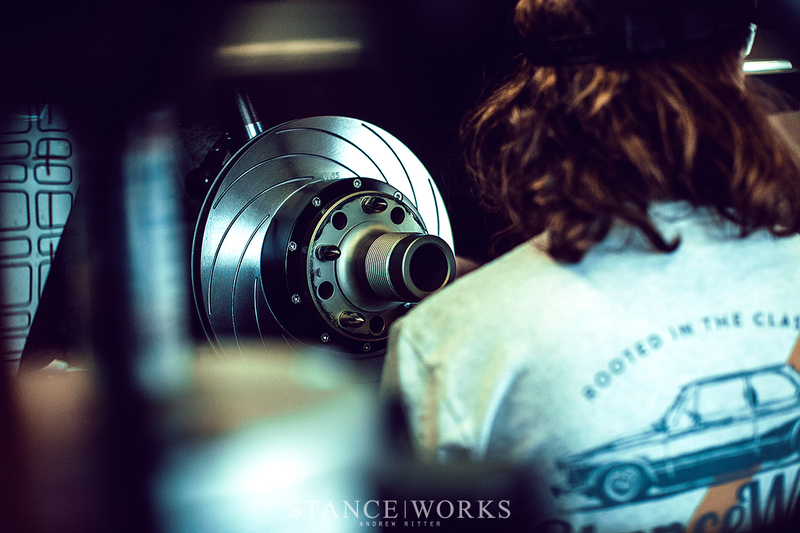 The rotors for the kit are built in a two-piece configuration, and are of course, directional for the left and right sides of the car. I wasted little time after the unboxing of the parts before I got to work on the car. 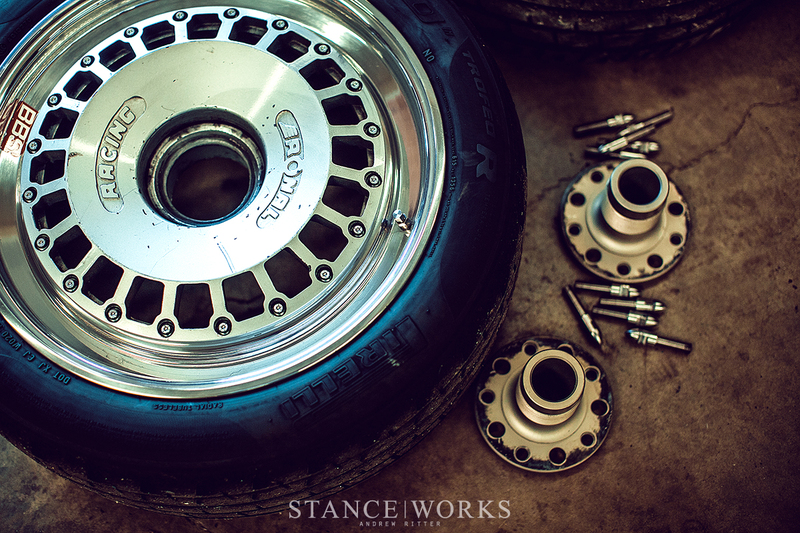 Once on the lift and with the centerlock wheels and hubs removed, I got down to buisiness, removing the E34 540i brake upgrade I had previously installed. Disassembly was very simple: with just a pair of bolts holding the old caliper on, a rotor retaining screw, and the original brake line, the car was stripped within minutes. The first task of installing the new upgrade was to fit the brake caliper bracket, which adapts the BMW's original caliper bolt spacing to the new Tarox B32 caliper. 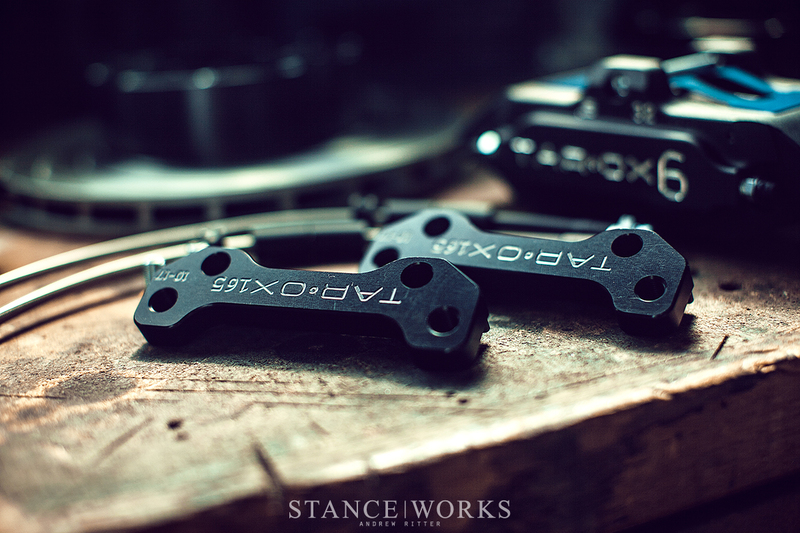 Machined from forged aluminum, these components are as nice as the calipers themselves, which offers some additional assurance about the quality of the kit. 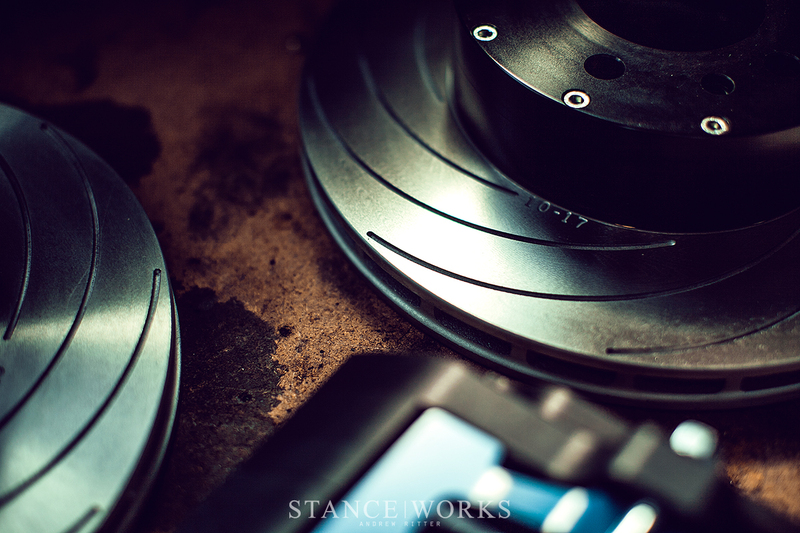 After all, brakes are the most important component of any car. 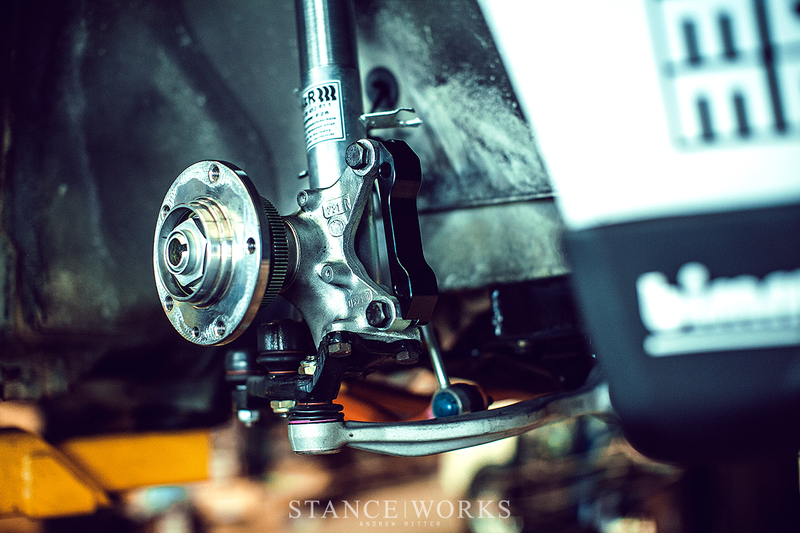 Installing the calipers was both simple and rewarding: with just two bolts, the caliper was in place and secured, and suddenly, I was able to step back and take a look as the new brake system was taking shape. I almost feel bad hiding such nice pieces behind nearly-solid faced wheels. From there, it was just a matter of connecting the braided and coated brake lines, which bolted into place, just like the factory counterparts. 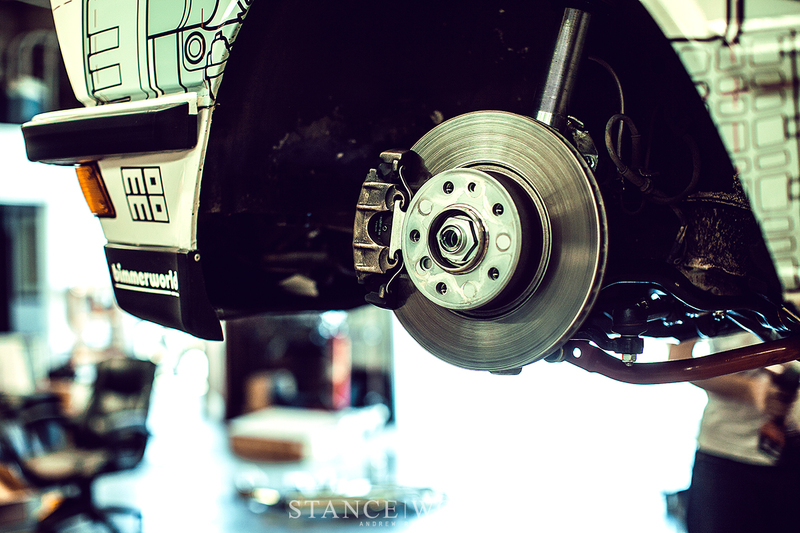 Within what likely took an hour, the braking system of the E28 was transformed, and ready to be bled. While bleeding brakes isn't a particularly difficult job to do, it can often require a friend for help. In our case, we used a pressure bleeder - a tool we can't recommend enough for any shade tree mechanic. Within minutes, the system was bled, and we were off for a test drive to bed in the track pads. The following day, we put them to work on the track. The improvement was immense, helping the car to achieve a new personal best at the famed Buttonwillow CW13 layout: 2:06.522. Now, with a few months of use, I couldn't be happier, both on the street and on the track. And we're glad to know at least someone out there is catering to those of us that love obscure, oddball, or just uncommon cars. Thanks, Tarox! Hi Mike, loving this upgrade. What kind of booster are you running or is this a boosterless setup?